It’s been a while since we’ve seen a new Etrian Odyssey game, huh? Sure, we were lucky enough to see remakes of the first two Etrian Odyssey titles with the Untold games throughout the past few years, but I bet that most fans by now are eager to dig into a completely fresh adventure. After all, the North American release of Etrian Odyssey IV is well over 4 years old. We’ve been waiting for something new for quite a while! Fortunately, the wait is almost over; in less than a week, Etrian Odyssey V: Beyond the Myth will finally be upon us. Considering how well-received previous titles within the series have been, I’m sure that most of you out there are already assuming that Etrian Odyssey V will be just as good — if not better — than its predecessors. And your assumptions would be absolutely correct! Etrian Odyssey V: Beyond the Myth isn’t simply just another “good” dungeon crawler. It’s a great dungeon crawler. In fact, I would even go so far as saying that it sets an example for what a truly high-quality DRPG should be in our modern era of gaming. Much in the same way that Persona 5 did with JRPGs earlier this year! 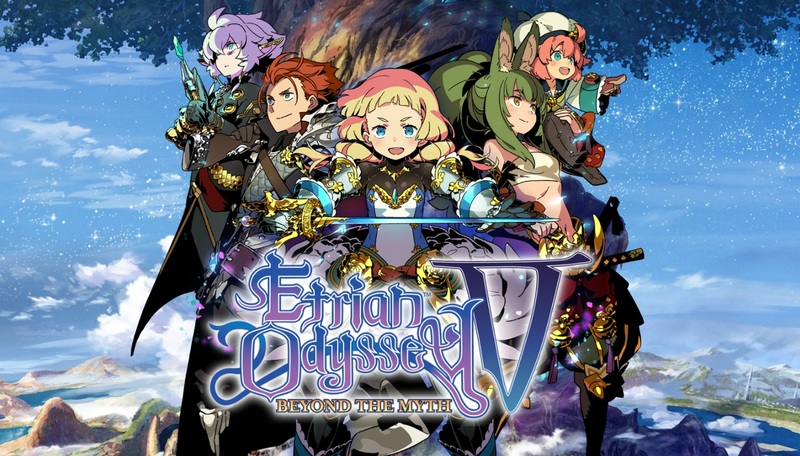 Although an entirely new game, Etrian Odyssey V presents a story that should seem very familiar to players with previous Etrian Odyssey experience. Rooted firmly within the land of Arcania rests a giant, towering tree known as the Yggdrasil Tree which, in turn, is surrounded by the prosperous city Iorys. For a long time, adventuring into Yggdrasil itself was expressly forbidden. But things weren’t destined to stay that way forever. One day, an official decree was released, inviting any and all who wished to climb Yggdrasil to do so. News of this decree quickly spread throughout Arcania, drawing in adventures from all around the continent. It also drew in little old you! Determined to make it to the top yourself, you quickly establish a party, gather a band of fighters, and begin your long and perilous journey through the mighty Yggdrasil. I’ll be the first to admit that, when it comes to the core story, Etrian Odyssey V doesn’t go out of its way to establish the most creative narrative ever. I would also argue, however, that that’s a good thing in this case. This is very much a game that’s less about the destination, and more about the journey. Rather than featuring a long, sprawling plot, Etrian Odyssey V feeds its story to player in bite-sized chunks. 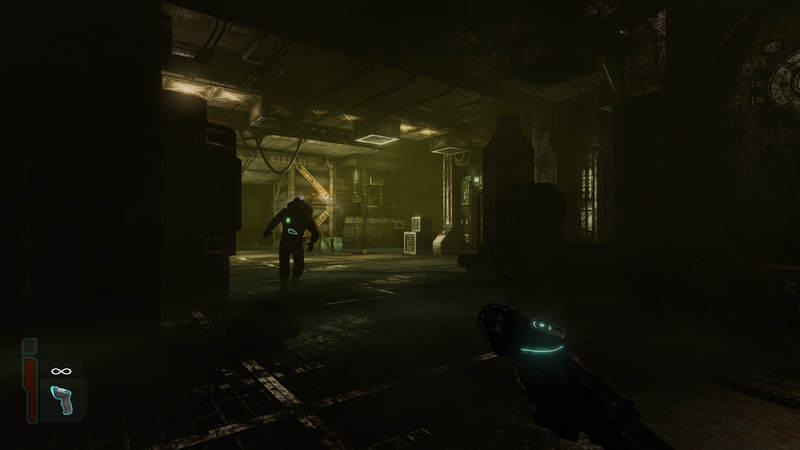 There’s just enough to keep things interesting, but never so much that it detracts from the game’s actual focus — the dungeon-crawling. And it does so at intervals that aren’t always predictable. While this might not work in other kinds of RPGs, a smaller, less story-focused game fits the kind of first-hand roleplaying that a DRPG such as Etrian Odyssey V allows players to perform perfectly. You, the main character, may be eager to carve a path through Yggdrasil, but you lack something important — combat ability. Fortunately, you won’t have to fight. You can just get other people to do it for you! As the newly-appointed guild leader of the (insert guild name here) Guild, you have the right to create a five-man party to do all of your dirty work for you adventure alongside you. As always, your party composition is of vital importance. 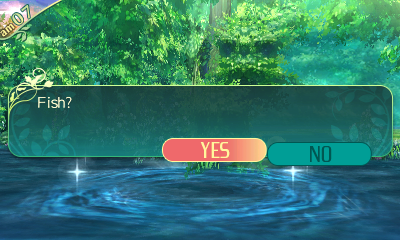 You may find, however, that things work a bit differently in Etrian Odyssey V than they did in previous games. Party Member placement is also important! Much of your party-making in Etrian Odyssey V won’t feel too different, but there are a few new twists this time around — primarily due to the addition of races. Unlike with prior games, Etrian Odyssey V splits its characters up into four different races — the all-rounder Earthians, heavy-attacking Therians, magic-slinging Celestrians, and support-savvy Brouni. As you would expect, your party members’ stats will develop differently based on which race they are. In the beginning, this doesn’t much matter. Each race is restricted to two classes initially (except Erthians, who have four), and these classes are best-suited to their specialties. While this may annoy some, I can appreciate the fact that Etrian Odyssey V subtly guides its players into choosing a more balanced party. You’ll be able to throw all of that balance out of the window eventually, though, if you’d like. 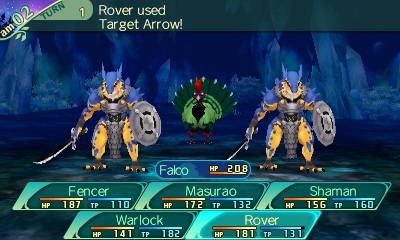 Do you remember sub-classing from previous Etrian Odyssey games? Well, that’s gone now. Instead, we’re given two new mechanics; class changing, and Master Classes. Class changing is pretty much what you expect it to be. It lets you change classes. It goes a little beyond that, though. Changing a character’s class also decreases their level by 5, and gives them extra skill and stat points. It’s a nice trade-off, but it’s mportant to change be mindful of when and where to change classes. Failure to do so might just lead to an unbalanced, and woefully under-leveled party! Be sure to choose your Master Classes carefully; there aren’t any take-backs! After hitting a certain point in the game, you’ll also be able to utilize Master Classes which are, in essence, “leveled up” versions of each of the 10 standard classes. Unlike with standard classes, each Master Class comes in two variants. These variants each come with their own specialties and secondary skill trees, and also grant your characters a nice little stat boost. I took quite a liking to Master Classes, however their sudden and unexpected appearance threw me off a little. Most Master Class skills require your characters to have proficiency with certain basic class skills. And, because of how I raised my characters, I didn’t initially meet many of those prerequeistes. In fairness, you can fix this by resting — which de-levels your character by 2, and resets your skill points — but I would have set things up differently had I known how Master Classes worked in the beginning. One of the things that impresses me most about Etrian Odyssey V is it the dungeon-crawling itself. Seeing as how this is the fifth (not counting spinoffs) game in the series, ATLUS easily could have thrown in some kind of gimmick to “spice things up”. Aside from the mapmaking thing, I mean. But it didn’t. 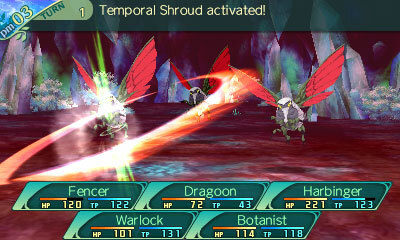 Rather, Etrian Odyssey V does its best to further strengthen the core mechanics that make DRPGs so fun. And it primarily does this through the many events that occur within the game. Is it just me, or does nothing beat a fishing trip in the middle of a monster-infested forest? What’s that? It’s just me? Like literally every other dungeon-crawler out there, Etrian Odyssey V will have you navigating through labyrinth after labyrinth, (literally) mapping out each twist and turn that you encounter. But it does its best to make this experience fun in and of itself by rewarding player curiosity. 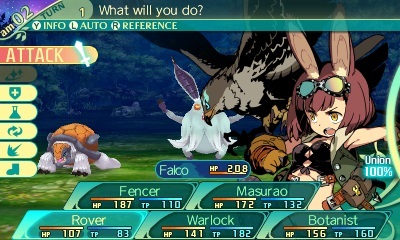 Etrian Odyssey V features a staggering number of sub-events, known as Adventure Episodes, and item gathering points for the player to stumble over while they’re exploring. Whether it’s picking some apples or fighting hordes of monsters, Etrian Odyssey V will always be throwing new activities and events at you. And, even better, you’ll frequently find these things while going the “wrong” way within a dungeon. 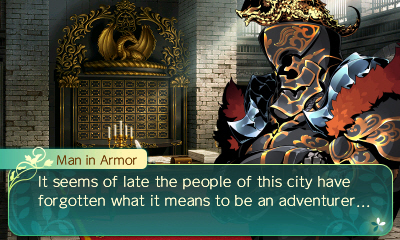 The fact that Etrian Odyssey V rewards its players for heading off the beaten path, regardless of intention, is a great way to encourage them to freely explore, and gives them plenty to look forward to while doing so. Enhancing these events even more is the fact that many of them require Race Skills to get through successfully. Heavy objects could require an Earthlian or a Therean to have the Bodybuilding Skill before they can lift it, while players may be able to avoid traps or uncover secrets using a Celestrian’s Detect Mana Skill (that one’s especially important, by the way). While I guess the argument could be made that dropping skill points into stuff like this could potentially detract from your party’s combat prowess, I feel as though it’s a major enhancement to the game’s roll-playing and dungeon-crawling aspects. Plus, these skills end up getting you plenty of loot. Everyone loves loot! 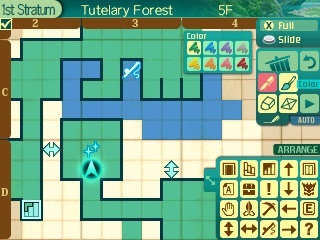 Love it or hate it, mapmaking is a quintessential part of the Etrian Odyssey experience. Naturally, that means that you’ll once again be charting Yggdrasil with the best of them in Etrian Odyssey V. I’ll be honest with you; mapmaking can be a little difficult. The only thing that Etrian Odyssey V does for you is mark the tiles that you’ve stepped on, the location of boss monsters, and, on occasion, certain objects. It’s up to you to add anything else. If you’re lazy, this could just mean doing nothing more than adding walls to your map. Or nothing at all, I guess. But where’s the fun in that? If you’re anything like me, you’ll want your map to be as detailed as possible. And this game has most definitely got your back on that. Making your own map is overwhelming at first, but it soon becomes quite satisfying. Etrian Odyssey V knows that most people playing it will want ridiculously detailed maps, and it has no qualms about letting players make that dream into a reality. Along with basic wall and tile-drawing tools, players are granted the ability to place a number of special icons on the map in order to mark things such as gathering points, events, and puzzle hints. Players are even allowed to tag individual tiles with short phrases in order to specifically remind themselves of what is there. Getting the hang of mapmaking takes time and effort. You’ll probably mess up a few times, too. Once you finally get into the groove however, drawing detailed maps becomes very enjoyable. Hopefully you’re ready to get into your fair share of brawls during your excursion through Yggdrasil, because this game will be throwing more than a fair share of random (and sometimes not-so-random) encounters at you. Etrian Odyssey V once again features classic turn-based combat which, in addition to being quite tough, is also rather complex in a way. And, although it might sound a tad ironic, I feel like part of the complexity stems from the player’s party. Most of this game’s classes, while balanced overall, take a bit of hands-on experience before you actually understand how they work. If you get a feel for your party in the beginning this isn’t a big deal. If you don’t pay attention to your strengths and weaknesses until later on, however, you might find yourself needing to take the time to re-spec or chance classes. Keeping the strengths and weaknesses of both your party and your enemies is vital. Of course, most of the combat difficulty simply stems from the fact that, well, combat is difficult! The monsters lurking within Yggdrasil aren’t just strong, but cunning as well. While there are monsters capable of tearing your party apart with a barrage of normal attacks, most monsters make use of buffs, de-buffs, and status-inducing attacks to take your team members down. Some of them even transform! Because of this, approaching battles casually is a very bad idea. Scoping out your enemy’s weak points, and making use of binds and ailments are absolute musts when in mid-skirmish. It should be obvious after reading this far, but Etrian Odyssey V: Beyond the Myth is an absolutely phenomenal DRPG. Featuring new mechanics, polished gameplay, and the same kind of dungeon-crawling experience that you’ve come to know and love, Etrian Odyssey V takes the Etrian Odyssey series to wonderful new heights. The sky’s the limit with Etrian Odyssey V! …Or at least the top of the Yggdrasil Tree. But hey, that’s still pretty high up!